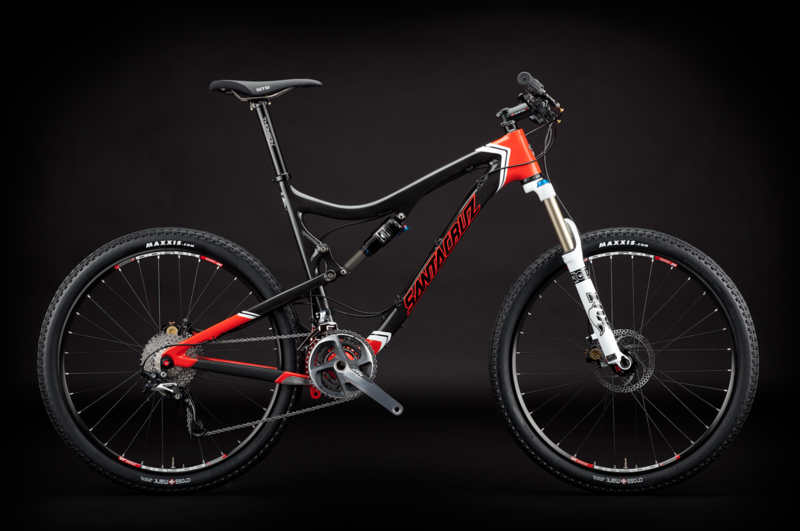 After a three-year hiatus, the bike that arguably put Santa Cruz on the map is back. 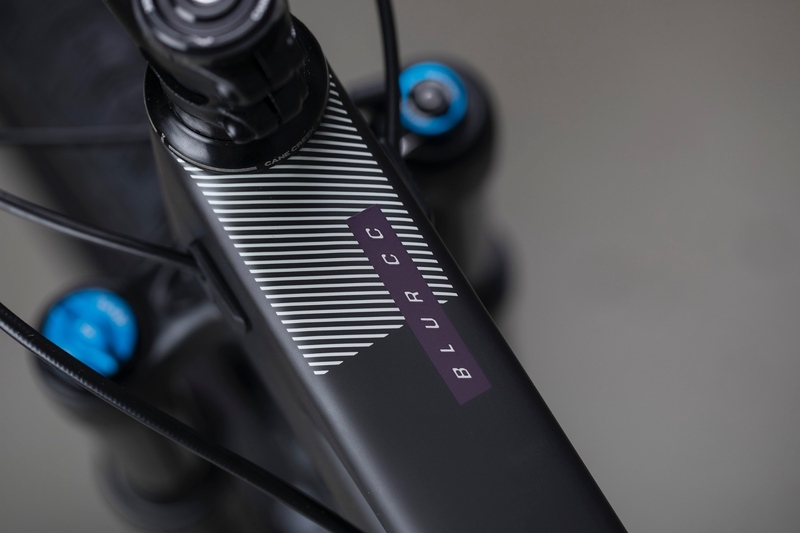 Meet the new Blur, a 29-inch wheeled full carbon XC speed machine with 100mm of travel front and rear, VPP suspension, aggressive geo angles, and a host of on-point features, including a bar-mounted dual remote lockout, two bottle cage mounts, and internal dropper post compatibility. 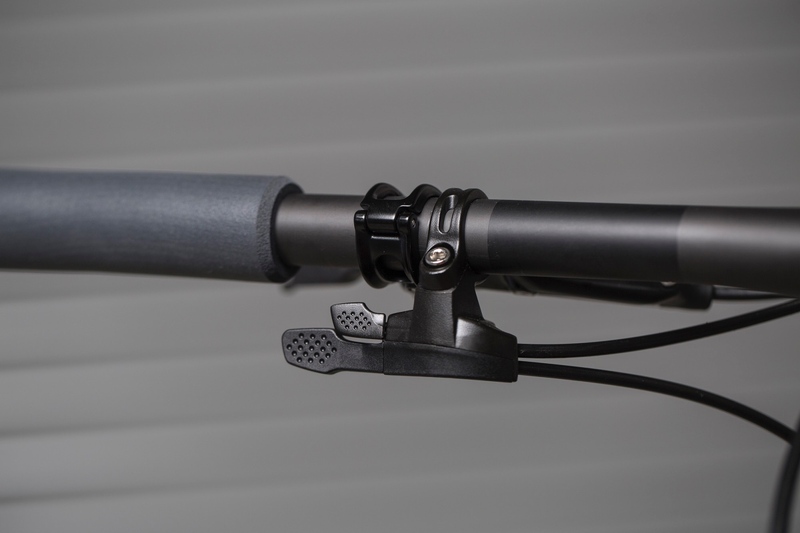 Key frame measures include an aggressive (but not too twitchy) 69-degree headtube angle and attack position-ready 74-degree seat tube angle. You can see the full geo chart below. 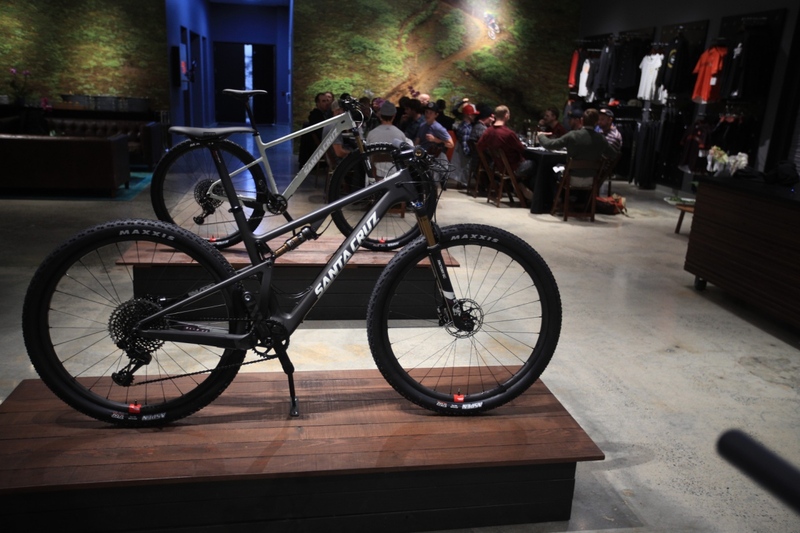 The bike comes in two frame colors (sunset and matte carbon) and six builds, including the World Cup-ready Blur 3 CC ($8999) with SRAM XX1 Eagle drivetrain, Santa Cruz Reserve carbon wheels, and Fox Float Factory DPS shock and Step-Cast 32 Factory fork. At the other end of the spectrum is the Blur 3 C for $3699. 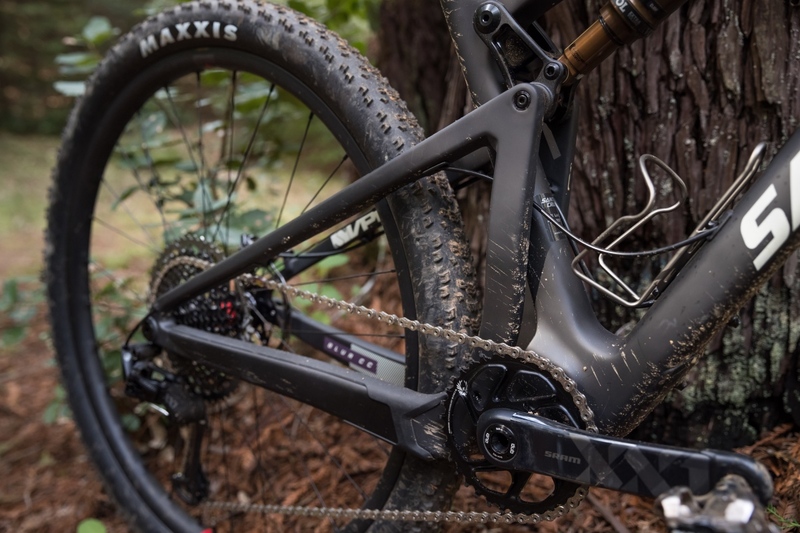 Besides the lower tier carbon frame, it comes with a SRAM NX 1x drivetrain, Fox Float Performance DPS shock and Rhythm 32 fork, and WTB STP i19 wheels. 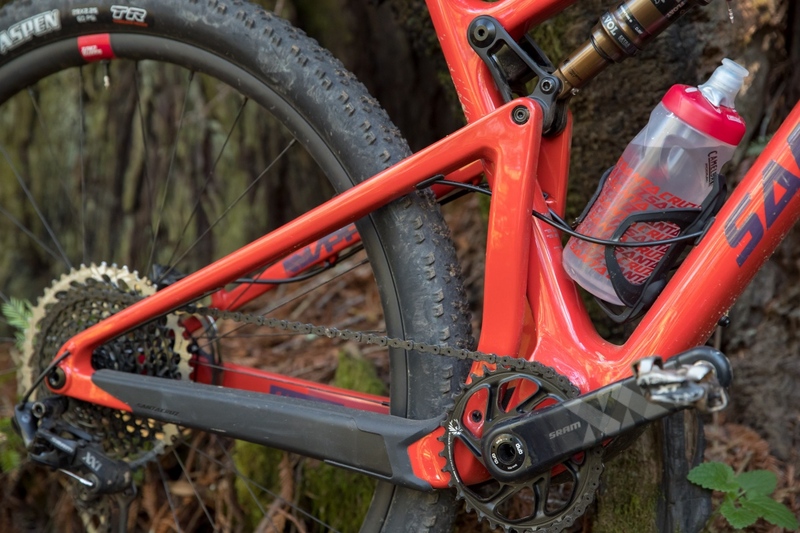 A Blur 3 CC frame with Fox Float Factory shock is $2999. You can see all the builds and pricing in the photo gallery below. 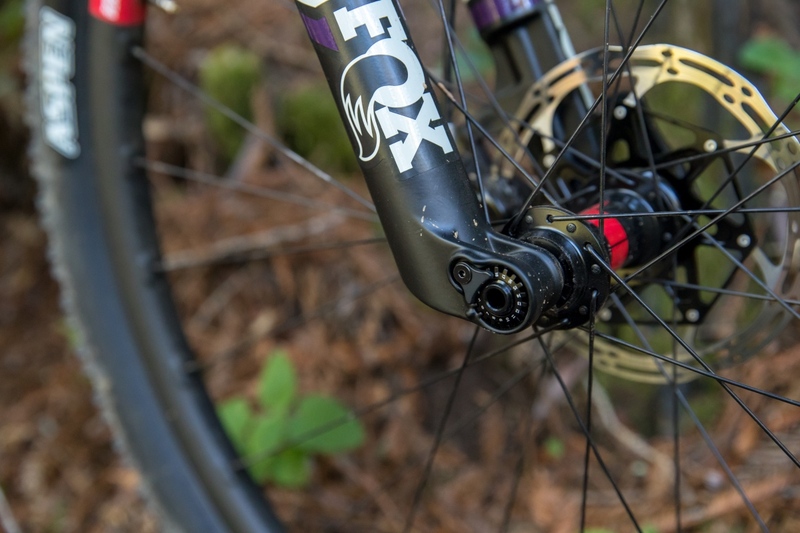 As you may have guessed by the drivetrain options, the new Blur frame is 1x only. 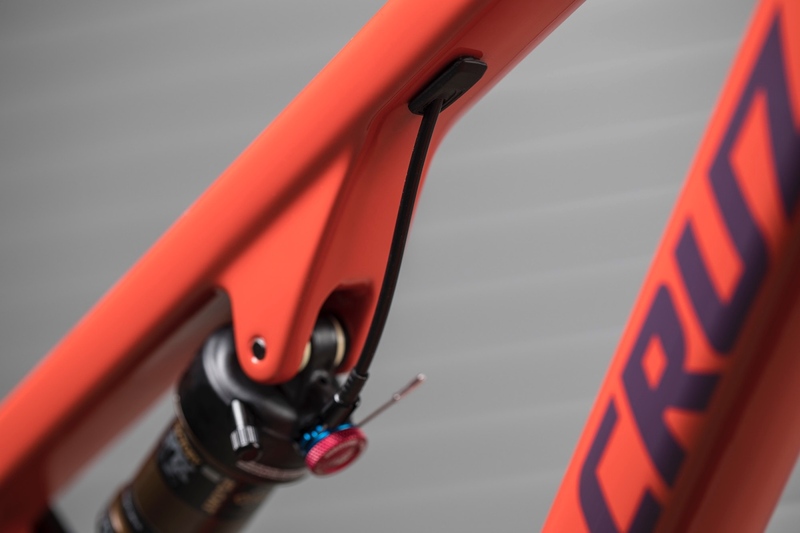 It also has a bolt-on downtube protector, internal cable routing, a threaded bottom bracket, boost axle spacing, and four frame sizes – S, M, L, XL. Claimed weight for a size medium top-shelf XX1 Reserve build is a gravity-cheating 21.9 pounds. 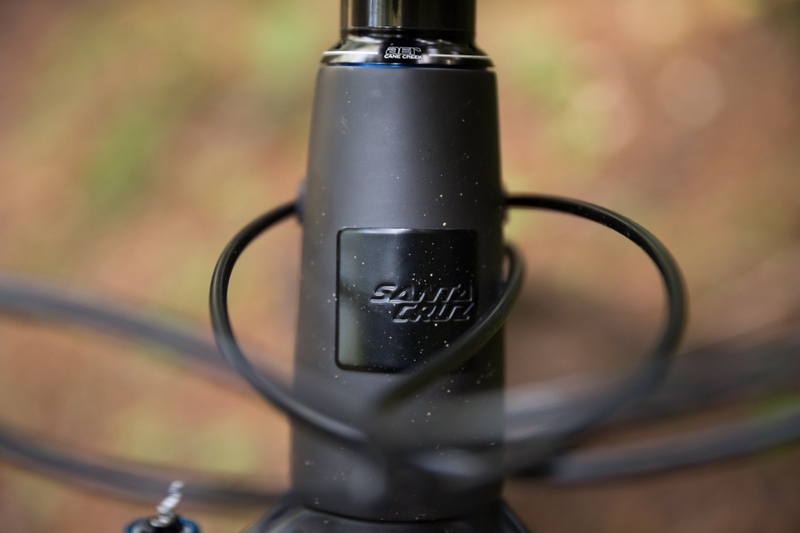 But Santa Cruz has never been a weight weenie company, and instead likes to point out that the new bike’s one-piece carbon VPP rear triangle actually shares a similar twin upright architecture to its World Cup-winning downhill bikes. 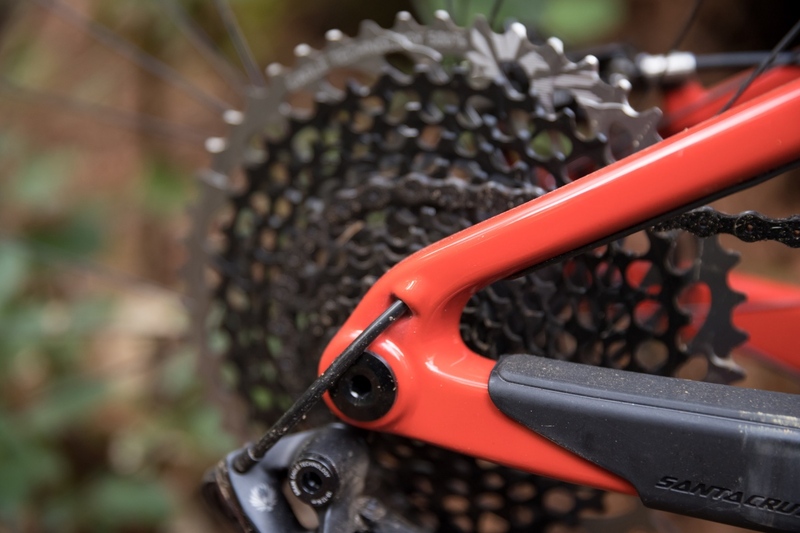 Pair that with a one-piece carbon front end, and the aim is to deliver lateral stiffness and tracking ability that’s often absent in the lightweight XC bike arena. 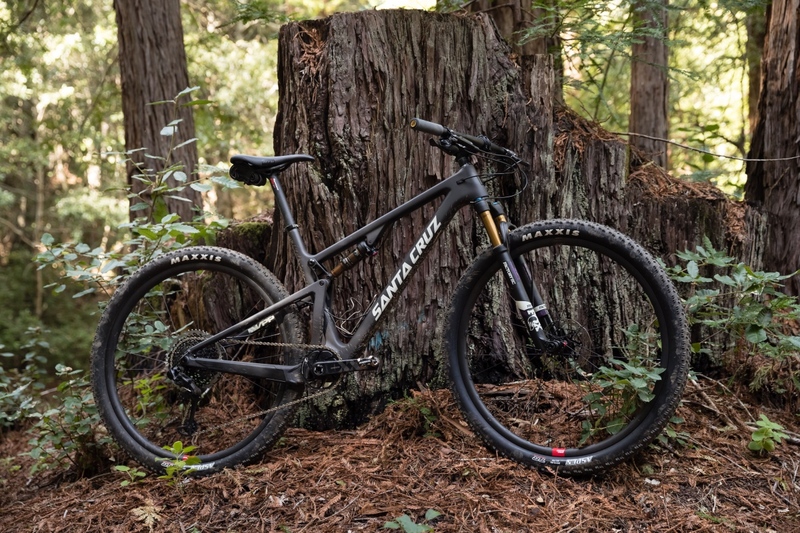 In early March, Mtbr took a three-hour test ride with 3400 feet of climbing on an XL-sized top-shelf Blur 3 CC. 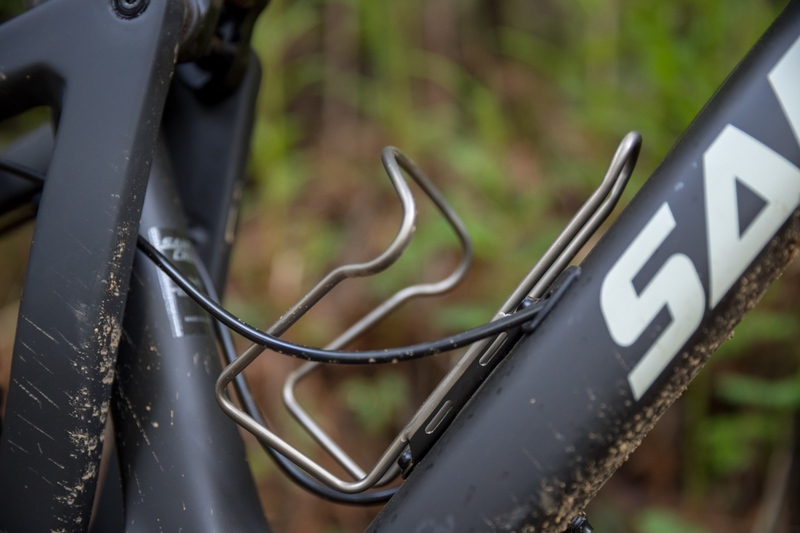 Not surprisingly this near $9k trail charger went uphill like an over-caffeinated whippet. 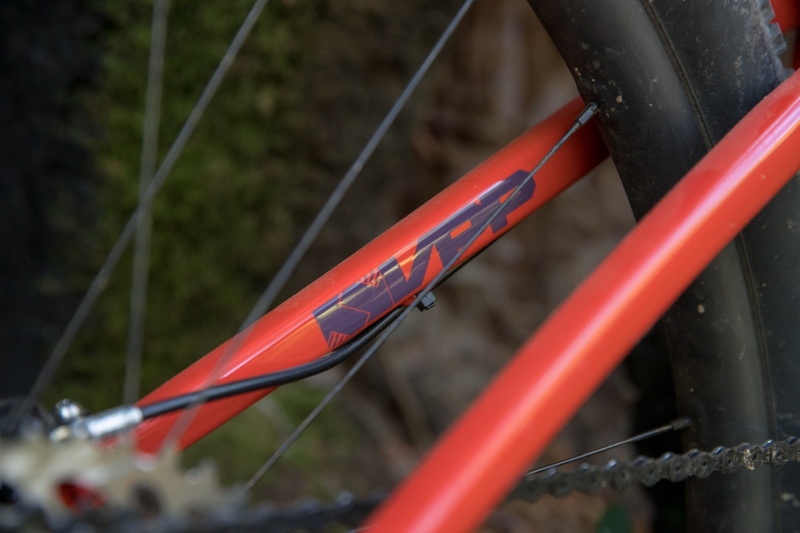 The left-side mounted lockout lever is a nice touch, but honestly on anything but smooth fire road we left the suspension open, knowing that the VPP design is one of the most pedaling friendly options on the market. And what little motion there was helped the stock Maxxis Aspen 29×2.25 tires maintain traction on the leafy trails. 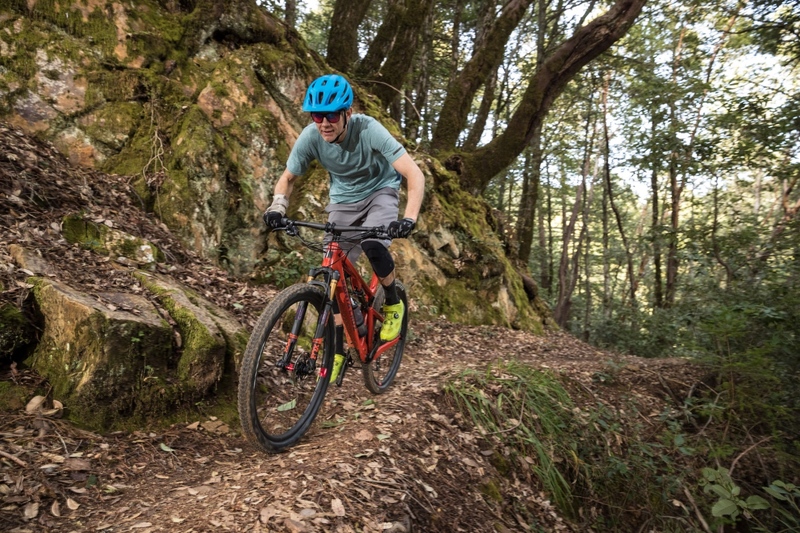 The real surprise came when the trail (in the Skeggs zone about an hour north of Santa Cruz HQ in Santa Cruz, California) turned downward. 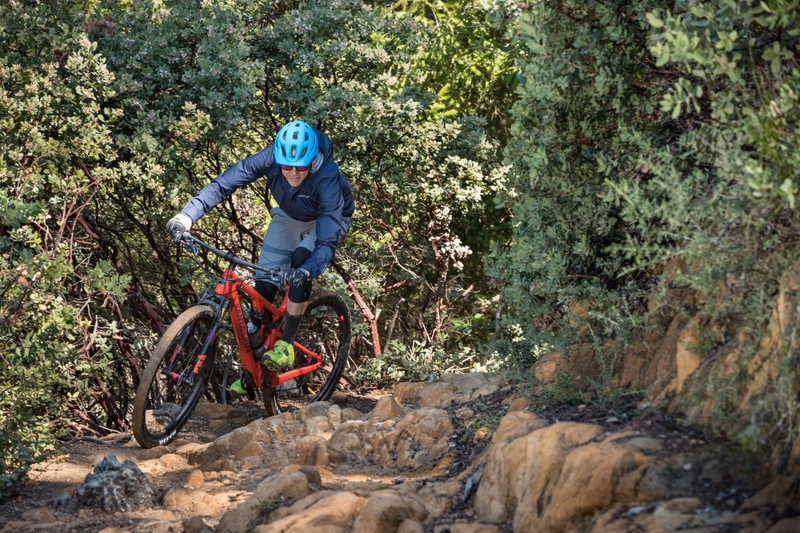 Despite what any enduro bro would regard as a ridiculously steep head angle, the Blur exhibited an unmistakable playfulness, not afraid to pop off small hits or take the aggressive line. 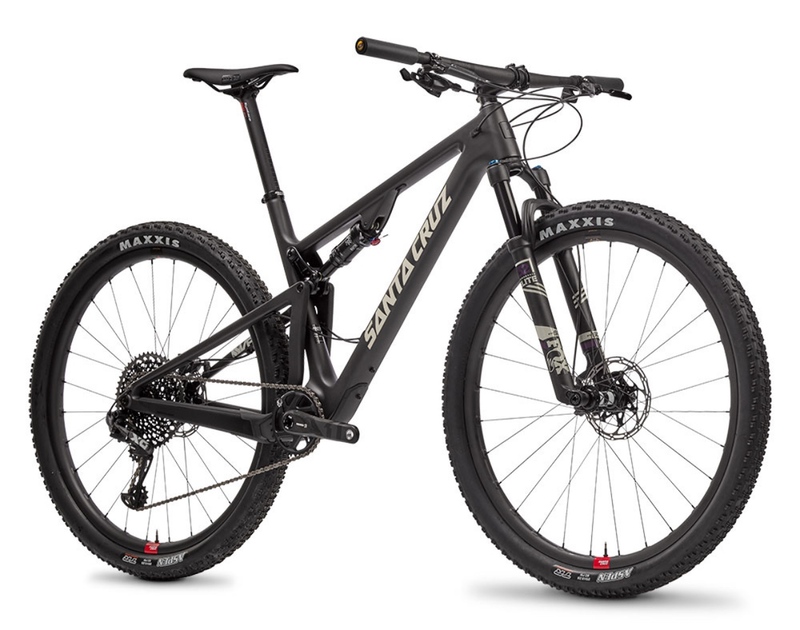 Mind you, this was aided some by the fact that Santa Cruz was kind enough to spec our test bike with a 125mm internally routed dropper post. 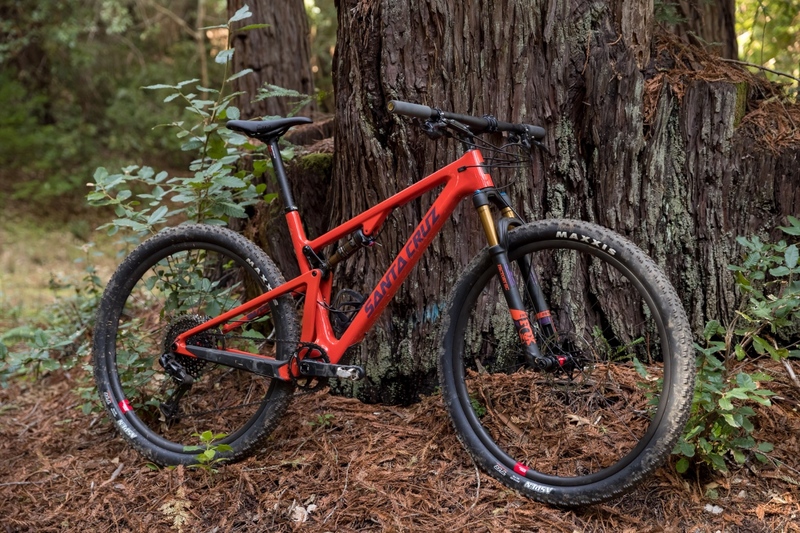 But honestly, while stock spec is a Syntace P6 Carbon HiFlex 31.6mm seatpost, we’d take the negligible weight penalty hit, and swap on a dropper if this bike was ours. 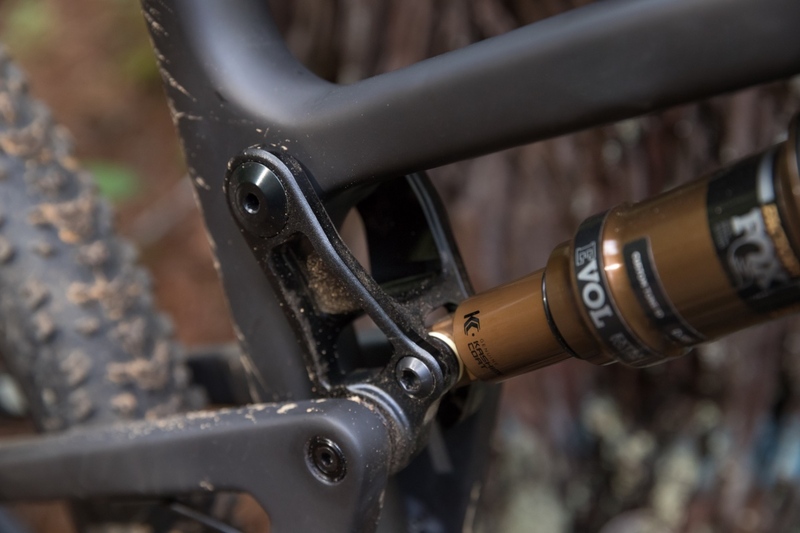 The one knock there is that with a dropper installed, the front end can get a little messy. But that’s nothing a little shrink wrap can’t address. Reach and overall cockpit room was spot on, with my 6-4 frame settling comfortably into the XL-sized tester. 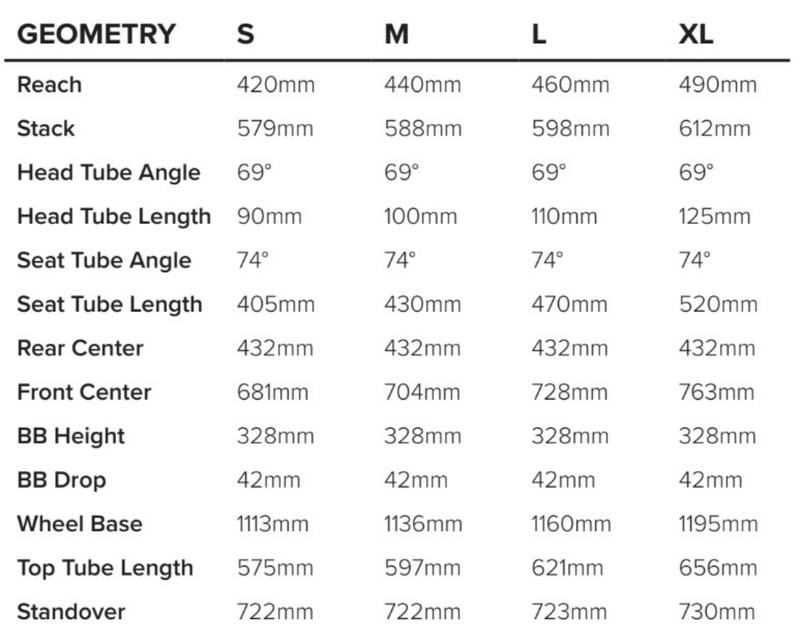 For comparison sake, the size large Blur has a 460mm reach, 728mm front center, and 1160mm wheelbase, while the 135mm Hightower trail bike is 450mm, 752mm, and 1187mm respectively. 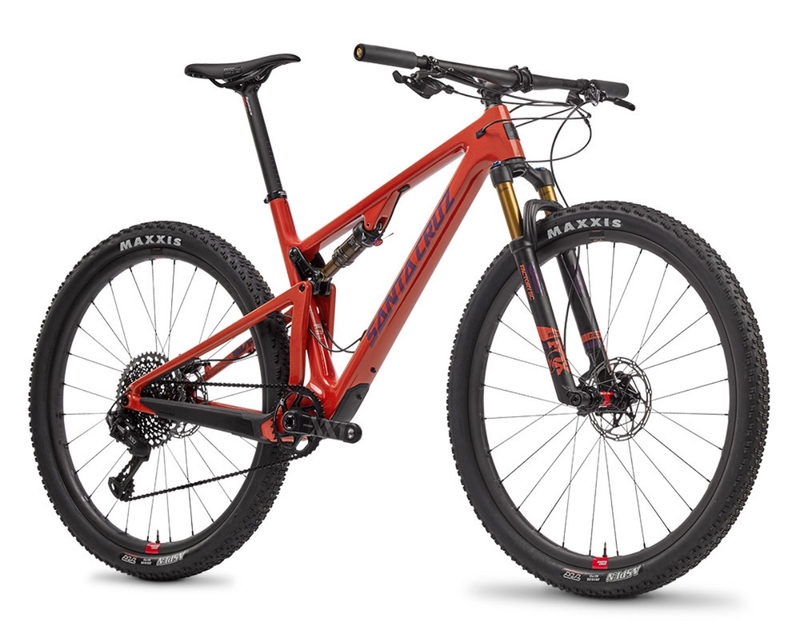 Bottom line, the new Blur is not a trail bike, but it’s also not a one-trick pony that’s only worth reaching for on race day. 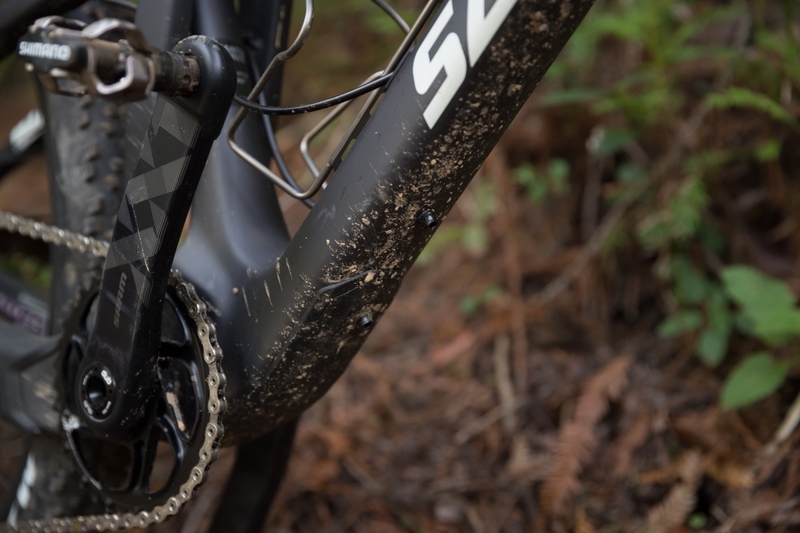 On the Skeggs test ride, which was mostly smooth, the bike was both fast – and a ton of fun — which will translate whether you’re chasing XC podiums or just out for some smile miles. 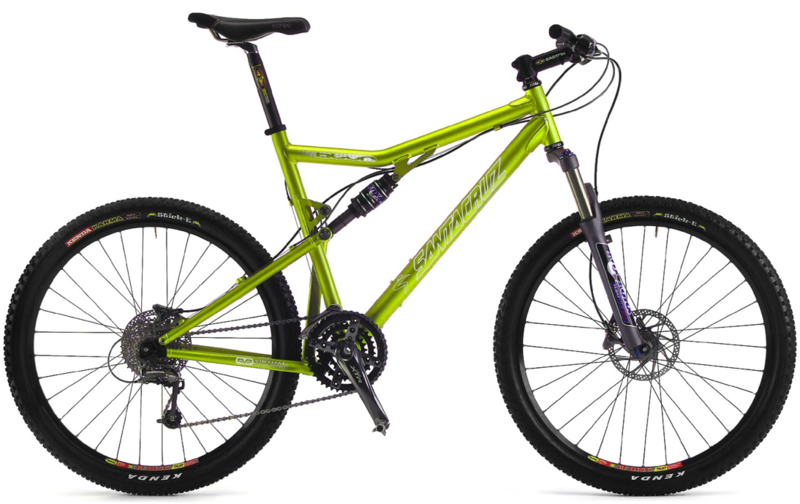 To learn more about the new Blur, head over to www.santacruzbicycles.com. 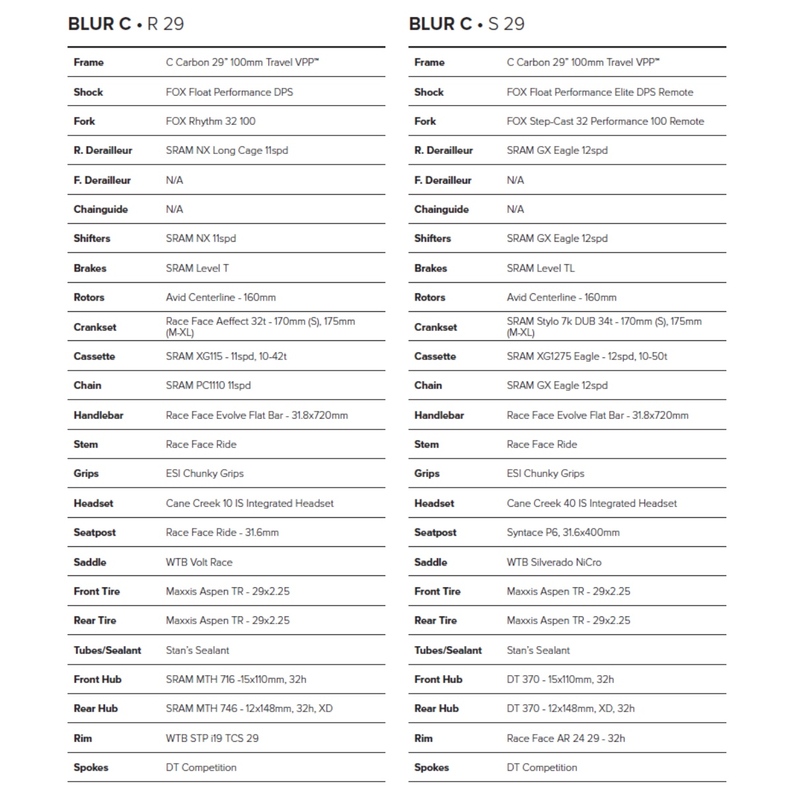 Pricing for the new Blur and Highball hardtail. 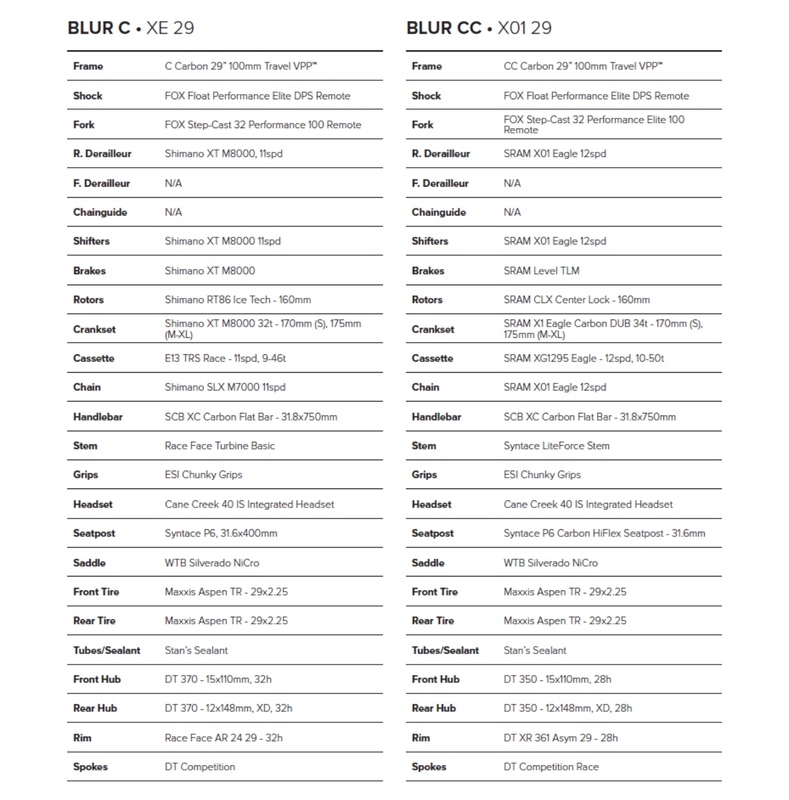 The two most affordable builds are the Blur C S and Blur C R.
Next comes the Blur C XE and Blur CC XO1. 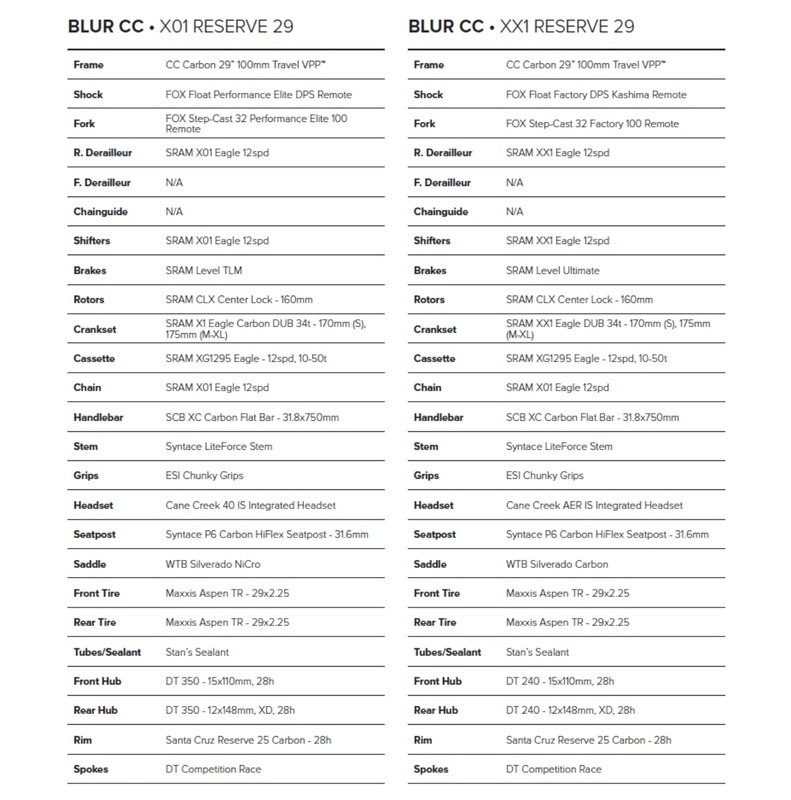 At the top of the heap are the Blur CC XO1 Reserve and XX1 Reserve.